Julius Hirsch returned from fighting the Japanese in the Aleutian Islands on a 30-day leave before shipping out to fight on Okinawa, and married Anna. This picture was taken in 1944. Photo provided. Julius Hirsch grew up in the Bronx and went to war almost a year before the Japanese bombed Pearl Harbor. He was a member of the 862nd Antiaircraft Artillery Battalion sent to the Aleutians when the Japanese invaded the barren islands off the Alaskan coast in 1942. “As soon as World War II started our battalion was shipped from Texas to San Diego. We were going on to the Philippines. By the time we reached California the Japanese had already captured the Philippines,” the 96-year-old Port Charlotte, Fla. resident who lives in Kings Gate subdivision explained. “Since we were an antiaircraft battalion they decided San Diego needed protection from a potential Japanese bombing attack. We remained there almost a year. 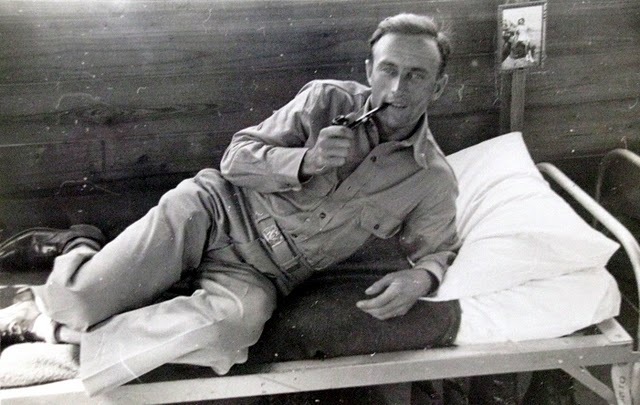 Hirsch and his pipe during boot camp in Texas in 1941, not too long before he shipped out for the Aleutians. Photo provided. After running the Japanese off Attu and Kiska the 862nd retired to Kodiak where the troops spent the rest of their time living in barracks in better conditions. “We left Alaska on Christmas Day 1943 and headed back to Seattle, Wash. From there it was on to Natchez, Miss. where I was given leave to go home and get married. When I returned to my post in Mississippi everyone in the 862nd began training to be combat engineers,” Hirsch said. “The entire five years I was in the Army I was a corporal. The reason I didn’t get any higher rate than corporal was because only five men in our outfit lost their lives, so there was no advancement. Besides English, Hirsch speaks German and Hungarian fluently, French well, and a little Italian. Born in Budapest, Hungary in 1914, he was the youngest son of royalty. His mother had been an Austrian-Hungarian countess before World War I when the empire collapsed. He and his older brother arrived in New York in 1929 in the first class section of an ocean liner. His mother, the countess, was waiting for them. 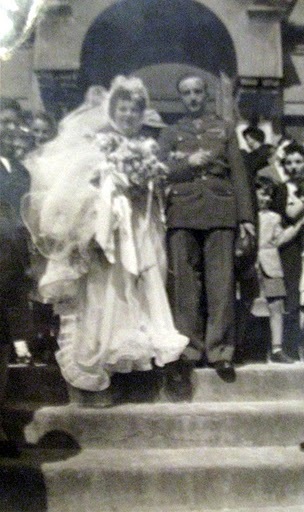 Hirsch and Anna marry during a 30-day leave in the middle of World War II before he left for the Pacific and Okinawa Photo provided. “Being royalty in this country didn’t mean much. It meant even less in the Army. I was just another corporal,” he recalled with a smile 70 years later. “There was still a lot of fighting going on when we reached Okinawa aboard an LST (landing craft) in mid-July 1945. About 30 ships had sailed from Washington to Okinawa in convoy,” Hirsch said. “Our job as combat engineers was to repair the runway on the north end of the island after the Japs bomb it. Four or five times a week they would crater the runway. The bad part was the enemy would come out of their holes and caves and shoot at us while we were doing the repairs. There was no place to hide from the Japanese fire except behind one of our trucks or tractors. “The infantry would come in and kill all the Japs in our area and then we’d be okay for a while. But by the next day they’d be back opening up on us all over again. This went on until the Japanese surrendered on Sept.2, 1945. “When they surrendered I was running the battalion motor pool. I had sent several trucks out to collect beach sand to fill in some of the bomb craters caused by Japanese attacks. It was late and they hadn’t returned so I took my Jeep and walkie-talkie and went looking for them,” Hirsch said. Julius Hirsch of Kings Gate subdivision in Port Charlotte is pictured in his dress uniform as a corporal in the Army during World War II. Photo provided. “I found them on the beach collecting sand. As we were standing there all of the guns aboard every ship off shore started firing. Everything was firing—big guns, little gun, machine-guns,” he remembered. “I said to the boys driving my trucks, ‘The Japs must be coming in to take the island back. Let’s get back to headquarters and see what’s going on.’ I called in on my walkie-talkie and found out the Japs had just surrendered! 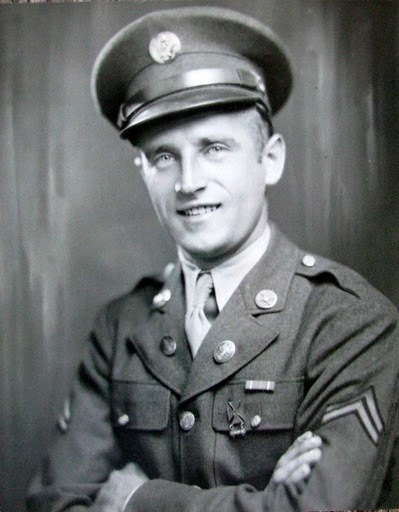 Hirsch and the men of the 1345th Combat Engineering Battalion didn’t go home right away because they lacked the necessary points to make it back to the USA. They spent the next three months waiting. While they did they experienced three major typhoons that battered the 70 mile-long Pacific island. 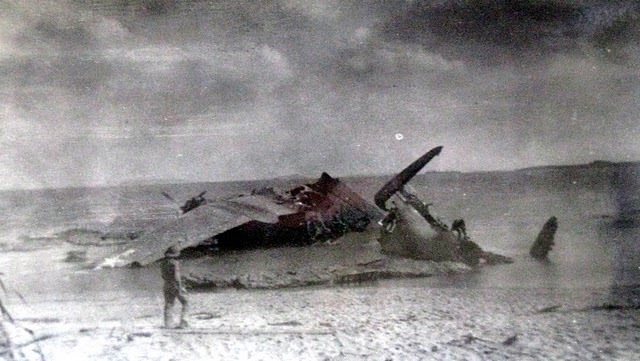 Hirsch looks at what was left of one of the American sea planes anchored off the beach at Okinawa after a Typhoon blew through the islands shortly after the Japanese surrendered in September 1945. Photo provided. In December Hirsch made it back to the States. He spent Christmas 1945 at home with his parents before returning to Fort Dix, N.J. for discharge from the U.S. Army on Jan. 6, 1946, some five years after he was inducted. Almost immediately he and a partner opened a Chrysler car agency in La Jolla, Calif., but had to close the dealership when the lease ran out on the building they had rented. After that he started a used car business in San Diego right across the street from the Navy and Marine Corps training centers. “It was a very successful business. I sold a lot of used cars to servicemen and bought them back when they were transferred out of the area and resold them again,” Hirsch said. Twenty years ago, after his wife, Anna’s, death he retired and moved to Naples, Fla. A decade ago he relocated to Kings Gate, a subdivision in Port Charlotte, to be near a nephew who lives in the area. Commendations: Asiatic-Pacific Service Medal, Philippines Liberation Medal, American Defense Service Medal, Good Conduct Medal. This story first appeared in print in the Charlotte Sun newspaper, Port Charlotte, Fla. on Thursday, October 14, 2010 and is republished with permission. Click here to view the Julius B. Hirsch Collection in the Veterans History Project. Julius B. 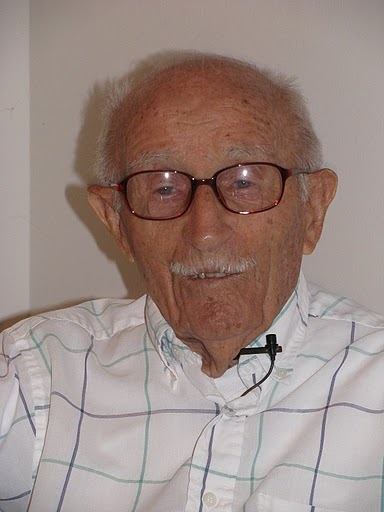 “Bill” Hirsch, 98, of Port Charlotte passed away peacefully at Tidewell Hospice on Thursday, March 14, 2013. He was born October 27, 1914 in Hungary to Gizella Hirsch amidst the start of WWI. Bill’s father was killed sometime during that war. At age 14, he and his brother Janos, emigrated to America (leaving his grandmother’s home) to join his mother and his oldest brother in Brooklyn, N.Y. Arriving in 1928, they began learning English, going to grade school, while his mother and eldest brother were already out working, and schooling at night. With the Depression on, they scraped up a living. Bill was employed in various shoe and slipper factories, where he met his future wife. Approaching 1941, with war breaking out in Europe, America instituted the draft. Bill was one of the first in Brooklyn to be drafted. He spent the next five years in the Army, being deployed in the Pacific Theatre of Operations. With the rank of Corporal, he was heavily involved with an Engineering battalion and anti-aircraft gun emplacements. His duties took him to San Diego to protect the air fields and military aircraft production. While in uniform he was made a United States citizen. 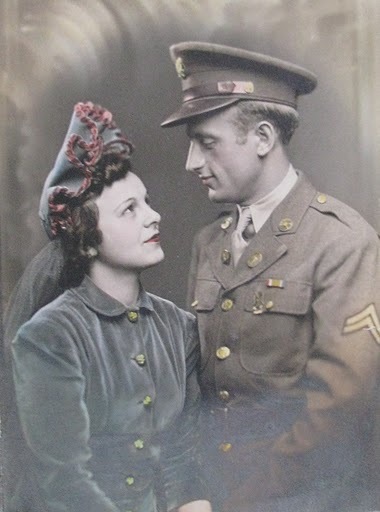 In 1944, while on leave to Brooklyn, he married Anna, his betrothed, and she became the typical Army wife, traveling from Post to Post until his discharge in 1946. They chose San Diego to settle down in, which has the “best climate”. There, Bill started a Mobil Service Station, and built it up to include sales and service of used cars. Having military bases nearby, G.I.s stationed there needed cars. In the late 70’s Bill and Anna (who was in charge of the office) retired, and lived comfortably. Bill would still work part time at the station keeping up goodwill. They had no children. With illnesses setting in the 80’s, Anna was diagnosed with cancer, and passed away in January 1991. With most of their friends and service buddies gone, Bill decided to move to Naples, Florida, where his nephew, John had retired. Wanting to live independently, he bought a condo a short distance from John. Life and times went on quite well. It was in Naples where Bill began his hobby of oil painting. He made 2 trips back to Hungary to visit distant cousins. He and Anna had also taken trips to Hungary during their retirement years. Bill was also an active member of The House of Hungary in Balboa Park and served as an officer for many years. In 1998 his nephew John moved to Charlotte County to be closer to a cousin, her husband, and an elderly uncle. Also getting older, Bill decided to make one more move to be more connected with family, and moved to a condo in King’s Gate, where he became quickly involved with new friends and activities. By 2012 he needed to slow down, with his advancing years, and was able to retire to Royal Palm Residence, and enjoy making new friends, and helping others. His nephew John Hirsch was his only living relative, who is responsible for completing his final arrangements. Bill belonged to the American Legion, and one of the wishes was to have an inurnment ceremony at his and wife’s plot in San Diego, to honor his Veteran’s service of five years in WWII. John requests that each friend and acquaintance offer up a prayer so that…”Angels May Sing Thee to Thy Rest”. Memorial donations may be made to Tidewell Hospice, 1144 Veronica Street, Port Charlotte, FL 33952. To express condolences to the family, please sign the online guest book.